The outcomes of an IG program will influence all information-related initiatives across the business. Astral can help you with an IG program to maximise the value of your information. Astral assists organisations to leverage solutions that manage their information assets. We have extensive experience in performing detailed strategic consulting. We take into account the people, processes, and pragmatic changes that are necessary to achieve the desired business outcomes. We undertake analysis and long-term planning to define a framework and IM strategy by which you can manage your information. Astral will evaluate the impacts of the digital marketplace on the way your organisation conducts business and advise on business changes to better leverage the digital economy. Astral can advise on standards and best practices specific to your industry. Our extensive experience combines with our detailed business consultation to enable us to assess your current information management practices and processes. Together, we can determine the most appropriate approach for introducing or extending the role of IM in your business. This service focuses on the feasibility of implementing an IM system and identifies the best implementation approach to achieve the desired business outcomes. This applies both to clients who have already invested in IM technology and to those who are yet to select a product. We work with you to develop your Business Case, manage the product selection process and define your Implementation Approach. Astral considers the culture of your organisation, your experience with IM, the short term business benefits that can be achieved and your long term business objectives. Astral can provide accurate and detailed estimates for all components of a proposed implementation project. These include external services, hardware, software and time commitment of internal resources. We can also provide an evaluation framework to assist in the product selection process. Astral can support the system from the business perspective in the form of a continuing enablement and mentoring program. This program can continue on from Astral’s involvement in your implementation or it can commence after a review of your existing implementation. Services can include alignment of business processes to an existing ECM implementation, business driven content migration or an ongoing training program for end users. Astral will invest in understanding your solution and business drivers to deliver ongoing value. This is integral with the monthly health check information and analysis. With additional input from the business, planners can contribute to capacity planning and infrastructure requirements. Based on a foundation of daily, weekly, and monthly health checks, Astral is able to monitor your solution closely and compile a list of recommended actions and priorities. These are structured into a program of work which is carried out methodically by the support team. Astral is able to work with you to schedule and execute software upgrades to deliver maximum business value. If Astral support staff cannot resolve a problem because it is a core product issue, it will be raised with the vendor and the issue will be managed to its conclusion. There are three main challenges related to training end-users in an information management solution. Delivery of the right message so that users will want to adopt new processes. Equipping users with the right amount of knowledge in an efficient manner. Ensuring that the organisation's internal policies are understood and adhered to. In Astral’s experience, when developing training you need to remember that every audience is different; the relevant messages must be developed specific to the needs of each group. Similarly, users are typically drawn to changes when they provide tangible benefits i.e. the what’s-in-it-for-me (WIIFM) principle. The training needs to incorporate how the business processes have changed as a result of using the new system, and how the changes will benefit both the user and the organisation. Training provides an opportunity to educate and motivate all impacted users because ultimately, your solution is successful only if it is being used. 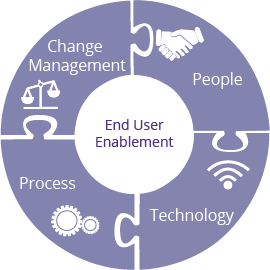 End-user enablement ensures that the business is equipped to deal with any issues which may arise from the transition to the new solution. To faciliate this, Astral conducts a Training Needs Analysis to determine which curriculum and materials will best suit your needs. The training course is designed to align with your corporate style and culture. The delivery of training is in the format(s) that best suits your users, for example, web-based modules, group classroom sessions, one-on-one meetings or train-the-trainer workshops. Astral encourages the use of feedback surveys and user-group meetings to determine the success of the program. Through our business-focused approach, Astral provides a flexible framework for implementing Information Governance (IG) and managing the associated change. The Astral approach does not separate the change activities from the Information Governance program activities; the two are intertwined and are parallel to any project delivery activities. As an essential part of an IG program, integrated change is incorporated within any ECM implementation to facilitate business user adoption and deliver sustainable results. Astral believes in a flexible, practical approach with a long term focus. We support a phased transition, rather than an “all at once” implementation. As well as having the tools to manage and secure an organisation’s information, Astral believes that human-focused programs are essential to enforce the management of the IG program and enable an organisation to achieve its goals. In the development of an IG framework, Astral take a pragmatic approach, leveraging any existing material or programs. The introduction of an IG framework requires users to learn the specific aspects of the framework, and also to learn how the framework is to be used to complete their day-to-day tasks. Practical guidance is important to foster changes to business processes and minimise the impact on end users. It is important to deliver the right message at the right time to the right recipient from the right source. Communications need to be a combination of top down and bottom up, tailored to stakeholders' needs. Development of a Communication Strategy in the early project stages is vital to managing the flow of information through the organisation. Astral has extensive experience in delivering training, both for end users, business administrators and support staff. When analysing the client’s capacity for change, Astral performs a training needs analysis to help the team understand and define training success criteria. It's no secret that Microsoft's SharePoint platform is now a key player in the Information Management (IM) space. Like any other IM solution on the market, it's important to understand the capabilities, and whether it's the right match for your business. Astral's services focus on making good strategic decisions. Before jumping in the deep end, our consultants can help you to understand if SharePoint meets your IM needs. By understanding your specific business requirements, we can perform a gap analysis to determine whether SharePoint is the right fit for your organisation. Will SharePoint make things better? There's a lot to know about SharePoint; the features and limitations that are relevant to your company may not be immediately apparent. We'll evaluate your requirements, consider your existing processes and systems and make unbiased recommendations on how well SharePoint fits in your organisation. What lessons can we learn from those before us? Many experts have questioned whether SharePoint measures up against other pure IM solutions. Others raise concerns about managing the proliferation of SharePoint sites long-term. Some see more value in leveraging SharePoint's interface combined with another vendor's IM repository as the ‘back-end'. Astral has a broad range of experience across the IM industry and understands the technical and business consequences of SharePoint's implementation options. We can define the Do's and Dont's of implementing SharePoint in an IM context. Will SharePoint work with other systems? Careful planning and detailed research is imperative if you need to share information across systems. Astral will analyse your existing systems and processes to define your integration requirements. We'll then help you to plan for integrating with other applications. How can we ensure our staff use it effectively? Astral provides tailored end-user training for SharePoint users. We'll focus on educating your staff on the business processes which ensure your information is accessible, secure and relevant. In Astral's experience, one size never fits all! Astral recommends taking a phased approach and leveraging 'out of the box' functionality. These phases are repeated for each new release of the Solution as additional functionality is introduced. We guide and mentor your team from beginning to end. We prototype and workshop with you to give your team a context in which to make informed decisions about the final system design. Our approach allows you to rapidly begin to utilise your investment; your staff acquire technical skills early in the project; you save money by not over-building the system with customised features. The Astral approach means early delivery, efficient use of resources and a final solution designed precisely to your business requirements. Implementing an Information Management (IM) solution requires the management of major change across the enterprise. Astral understands that this is about team work. We work with your team to ensure the change management is aligned with the solution configuration and is fully supported by the technical infrastructure. We mentor your team and share our experience and lessons learnt – this lowers the overall project risk.